The Murray-Darling Basin is Australia's largest river system. It has important social, economic and environmental values. The Murray-Darling Basin reaches into Queensland, New South Wales, the Australian Capital Territory, South Australia and covers half of Victoria. More than two million people live in the Basin, including about 500,000 Victorians. It is home to around 40 Aboriginal nations whose spiritual connection to their land, water and environment has extended over many thousands of years. 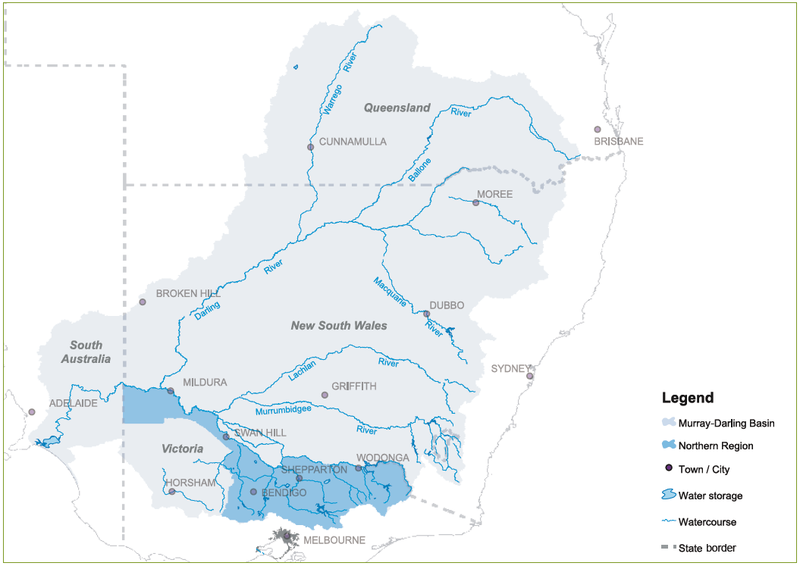 More than three million people rely on the Murray-Darling Basin as a source of water. Two-thirds of Australia’s irrigated farmland is found in the Murray-Darling Basin. Farming supports strong rural communities and economies. A healthy Basin environment is good for everyone: it ensures a high-quality water resource, and protects and enhances the Basin’s natural assets for future generations. There are 77,000 kilometres of rivers in the Basin. Part of the River Murray and its tributaries flow through Victoria, including the Kiewa, Ovens, Broken, Goulburn, Campaspe and Loddon river systems. The network of rivers, wetlands and floodplains are habitat to ancient river red gums and many plants and animals. There are more than 400 high value wetlands in 30 wetland systems across Victoria's north. These range from large areas of floodplain, such as the Barmah and Gunbower forests, to small wetlands on farms and public land. Irrigated and dryland farming and associated industries in Northern Victoria contribute significantly to the Australian economy. The Sunraysia irrigation region in north western Victoria, on the south bank of the Murray River, is a significant producer of dried fruit, table grapes, wine grapes, almonds, pistachios, citrus and vegetables. The region exports about $340 million of agricultural produce annually.